Da Capo Lifelong Books, 9780738216034, 384pp. Our fascination with what we eat, its provenance, and its preparation just keeps growing--and food writing has continued to explode. Once again, editor Holly Hughes plumbs magazines, newspapers, newsletters, books, and websites for the year's finest culinary prose--"stories for connoisseurs, celebrations of the specialized, the odd, or simply the excellent" (Entertainment Weekly). 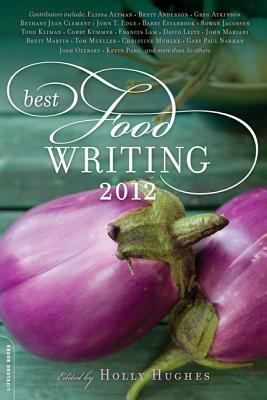 Featuring essays and articles from established food writers and rising stars, as well as some literary surprises, Best Food Writing 2012 captures the trends, big stories, and new voices. From going hunting to going vegan, from soup-to-nuts or farm-to-table, there's something for every foodie in the newest edition of this acclaimed series. Previous contributors include: Brett Anderson, Dan Barber, Frank Bruni, John T. Edge, Jonathan Gold, Gabrielle Hamilton, Jessica B. Harris, Madhur Jaffrey, Francis Lam, David Leite, J. Kenji Lopez-Alt, Molly O'Neill, Kevin Pang, Ruth Reichl, Alan Richman, Kim Severson, Jason Sheehan, Sam Sifton, John Thorne, and Calvin Trillin. Holly Hughes has edited the annual Best Food Writing series since its inception in 2000. The former executive editor of Fodor's Travel Publications, she is also author of Frommer's 500 Places for Food and Wine Lovers and Frommer's 500 Places to Take the Kids Before They Grow Up. She lives with her family in New York City.